Just imagine, you’re sitting or standing at a party, bored out of your mind, constantly looking at your watch waiting for the right time to split without being rude. You’re seconds away from doing so, when out of nowhere that band you’ve been listening to against your will is joined by one of the most iconic and influential rock singers of all time. That’s exactly what happened at the Fox Inn in Stourton, England just a few days ago. 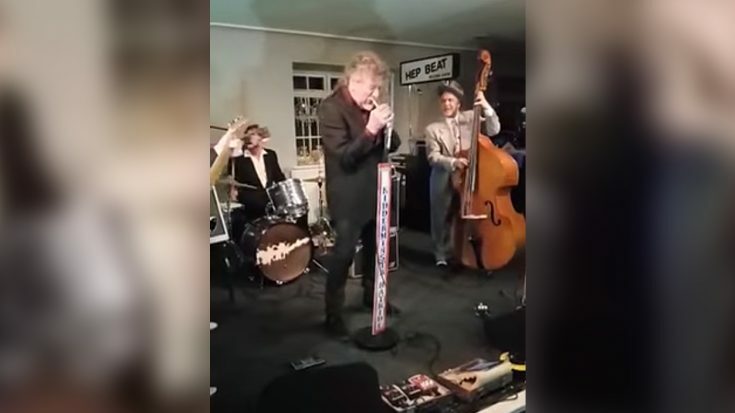 Things got wild and WAY more awesome when Robert Plant decided to brighten up the party by joining the band on stage to sing 9 minutes worth of awesome Elvis Presley covers. What’s amazing here is that even though Elvis and Robert’s voices have styles that seem like they’re worlds apart, Robert does an amazing job of capturing Elvis’ unique vocal style thus making for some amazing covers! From start to finish not only is Robert Plant knocking these covers out of the park, but so is the band who as you’ll see are an incredible bunch of musicians. From head to toe this ensemble is a great one! What you see here is worlds colliding in the coolest way possible. One iconic rock legend honoring another and putting on a wicked show in the process. Lord knows what I would give to be at the party seeing Robert Plant singing Elvis tunes. Watch below and see for yourself!